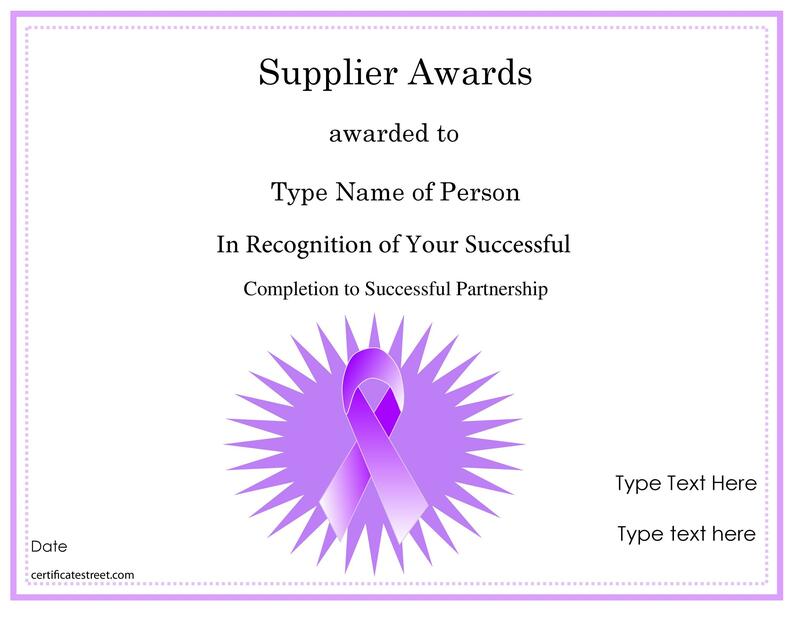 Awards are a great way to encourage good behavior, set industry standards, and recognize excellent work in a variety of fields. 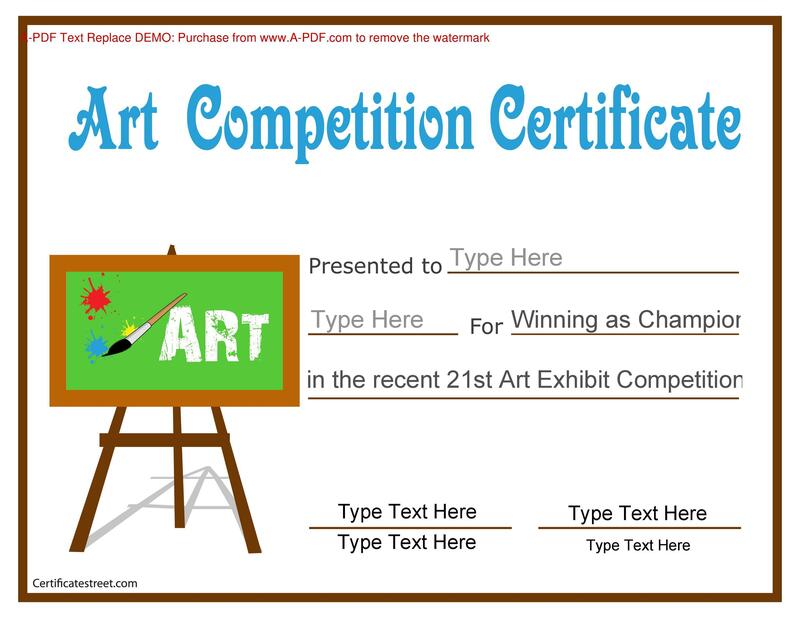 Whether you’re holding a poetry competition or handing out appreciation at a grade school, when you give out an award, you’ll want to make sure that it is simple, clear, and, in most cases, frame able. 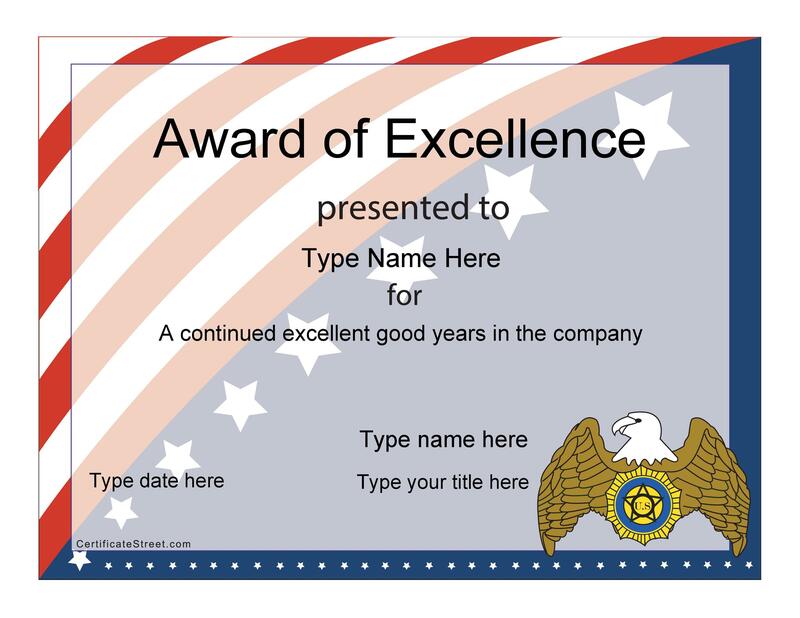 Don’t skimp on your award template choice. Look through all the templates we have available. Take your time experimenting with color, adding logos or creative elements. 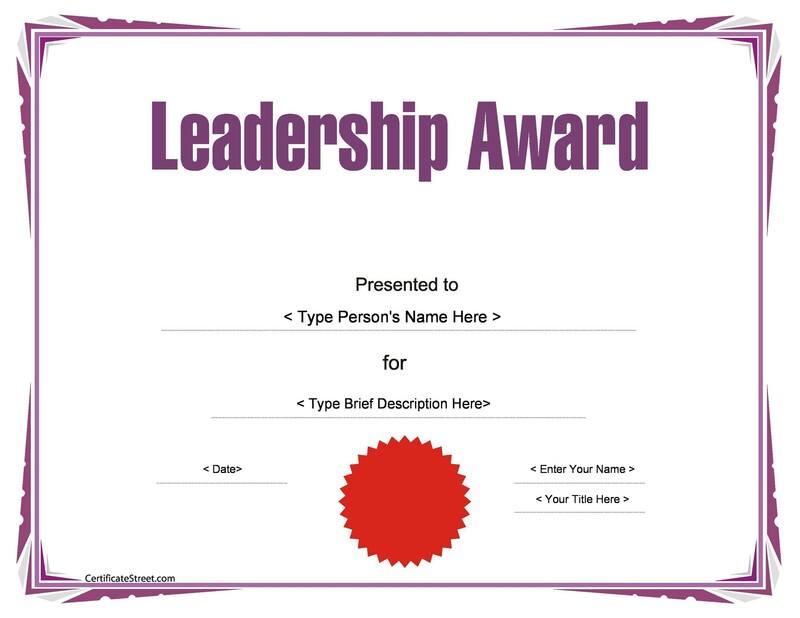 Generally, you want to make the award seem like it’s your own. To do this, all you need is some creativity and a word processing program such as Microsoft Office. 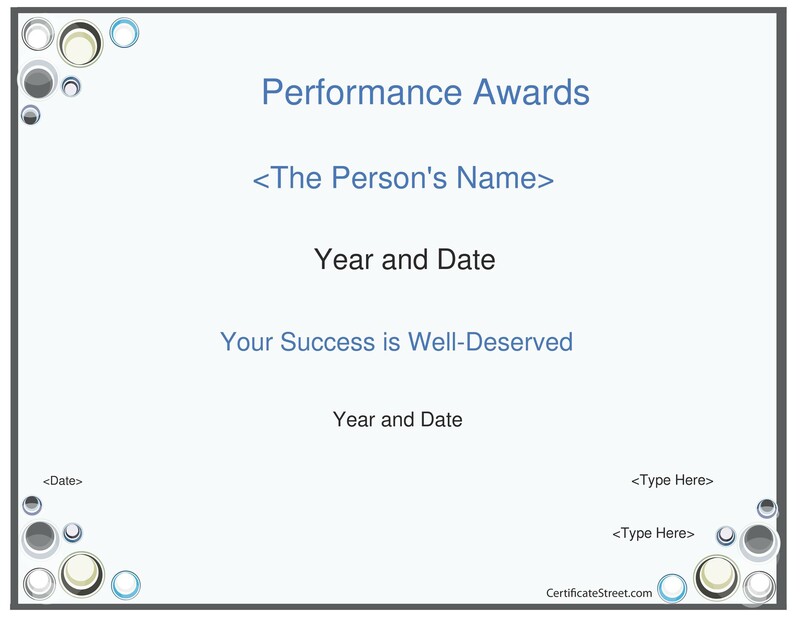 We have plenty of free award templates on this page to get you started to running your own awards program or competition. 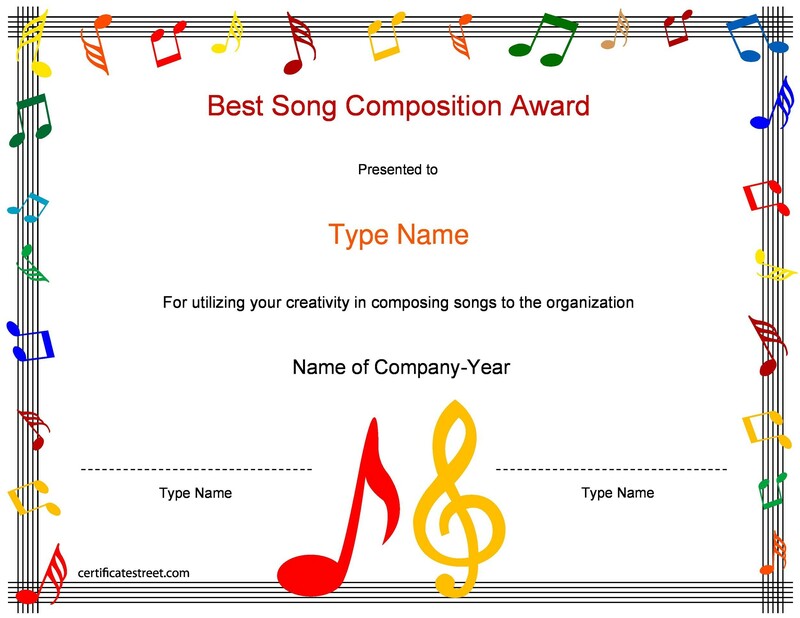 Read on to learn more about some interesting ways to use these templates. If you’re a business manager or employer, you know that good work often comes from people who feel good about their job, and their place in the workplace. You may be a small business owner that can’t afford a lot of raises, or you may want to add something special to your workplace culture to help employees feel great about the job they are doing. 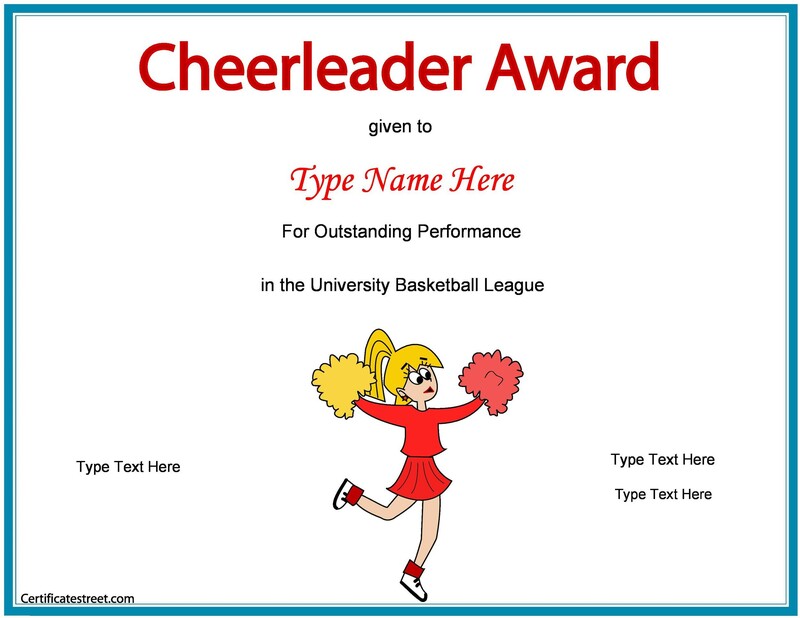 Whatever the case, you will probably want to have a printable award template on hand to make your award official. 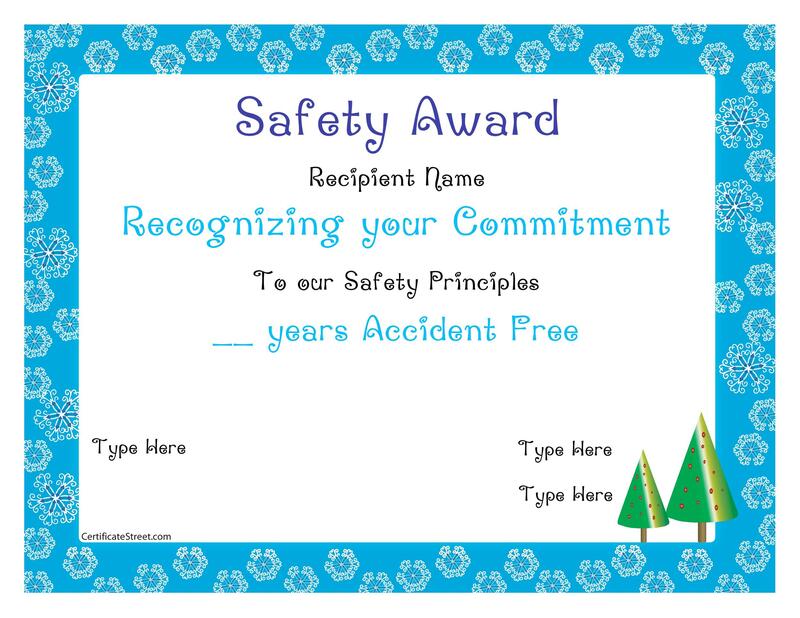 There are many aspects of a job that you may find you want to award people for, but before you begin printing out awards, stop and think of the consequences. 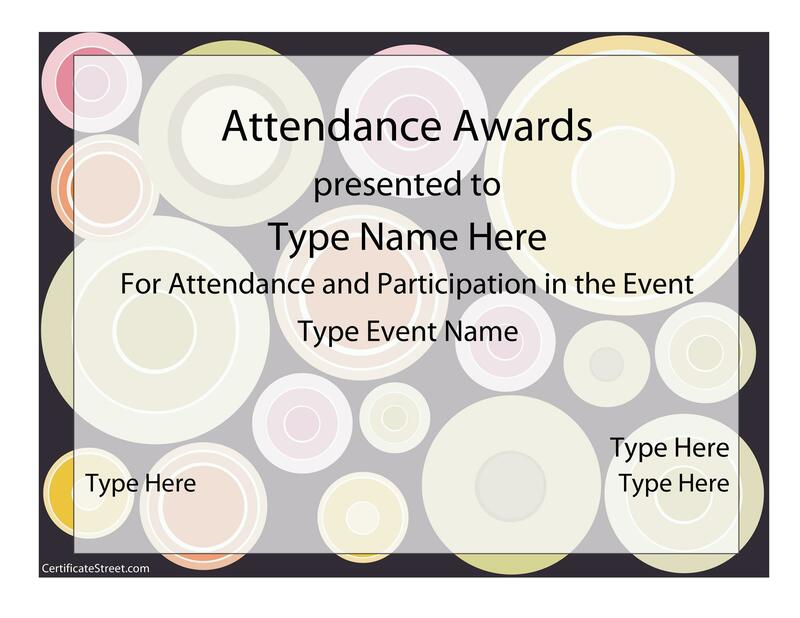 Do you really want to give an award for perfect attendance, knowing full well that the person who will receive it came to work sick and caused others to stay home? Do you really think that “always on time” is a better attribute than being the most creative salesperson, with some of the largest sales in the company? When you’re thinking of awards, think of the end result that is achieved in the workplace, not of the ins and outs of the day. You may want to focus on sales goals or customer service milestones. That’s fine. Just make sure that the things you are actually rewarding are behaviors that contribute to your business’s good image in the community or bottom line. In the real world, although perfect attendance is admirable, it doesn’t necessarily contribute to a business’s bottom line. Think about what tasks are most important when it comes to your business. Is it the sales team making phone calls? Your marketing team creates interesting ads? These are the types of tasks you want to hone in on, and recognize when it’s time to choose what awards you will be giving out. 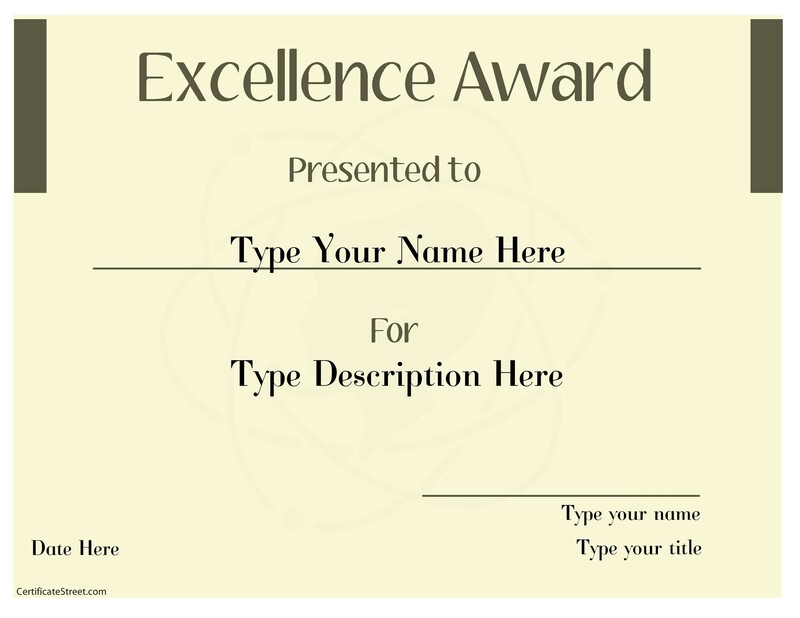 We have plenty of free award templates on this page to help you, one you know what you want to be rewarding, and how you plan on judging award recipients. Many corporations offer incentives for volunteer work, and some will even give time off on a Friday for their employees to do this. Have you ever thought about this for your own company? Do you know any employees that give a lot of their time to help struggling kids or adults in your town, county, or state? 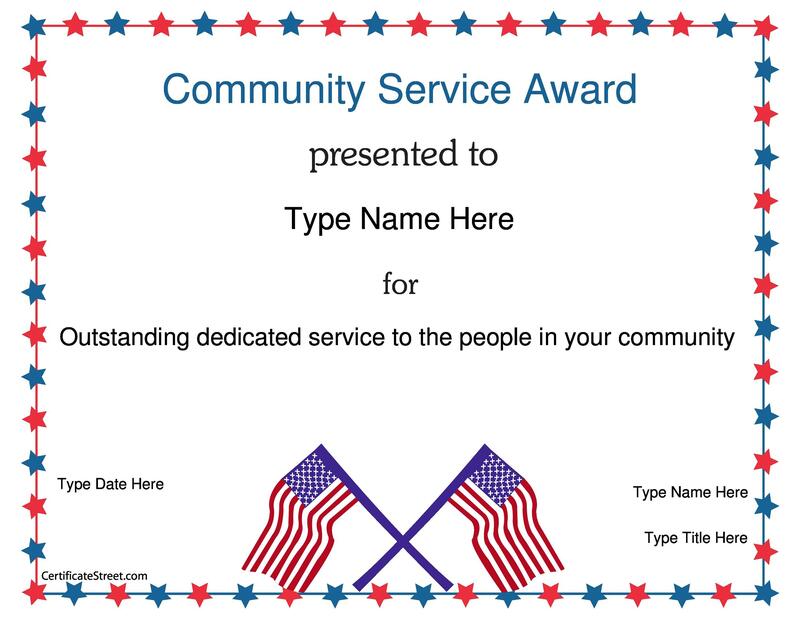 If so, you may want to create an award to encourage “giving back”. 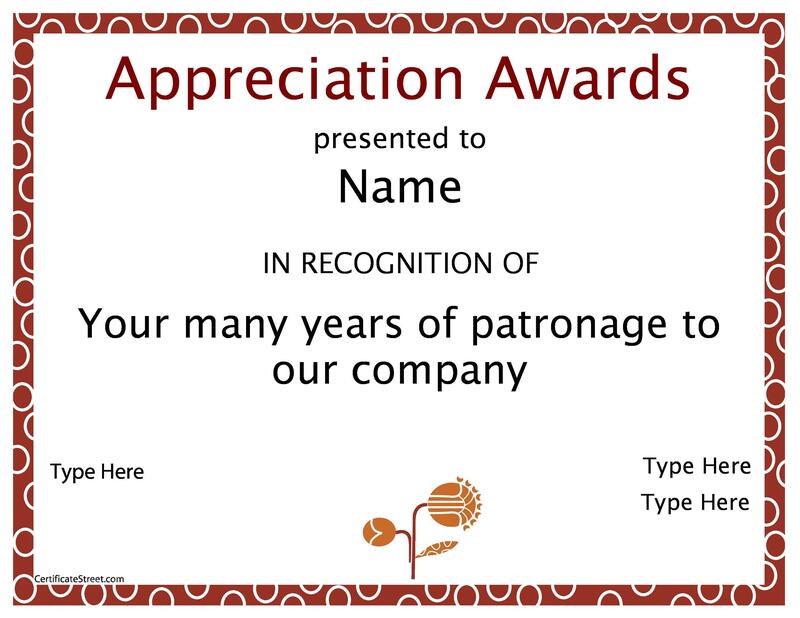 It’s a great way to say thank you and also show how your employees have a positive impact on the community. 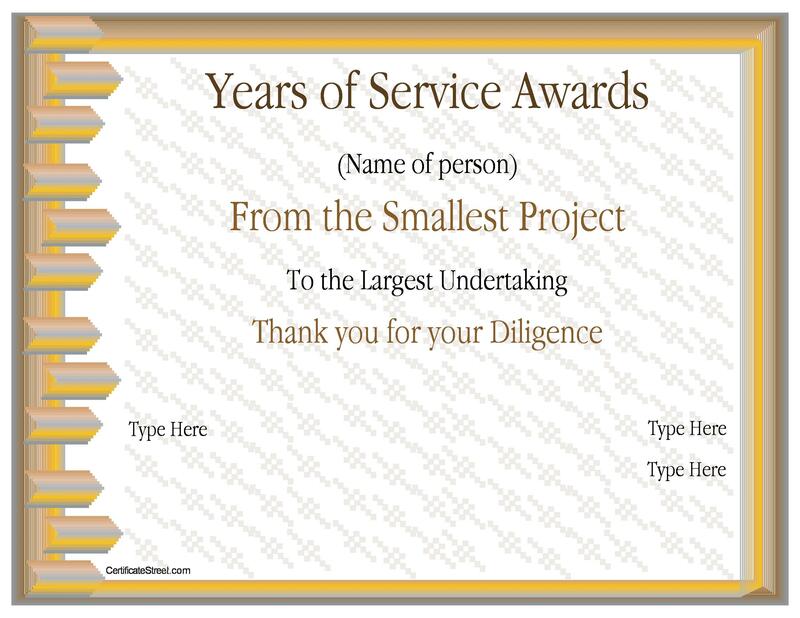 Did you have a particularly difficult project this year that required a lot of help or overtime? Maybe you launched a new initiative that had your social media team, PR team, or web designers working around the clock to please your clients. 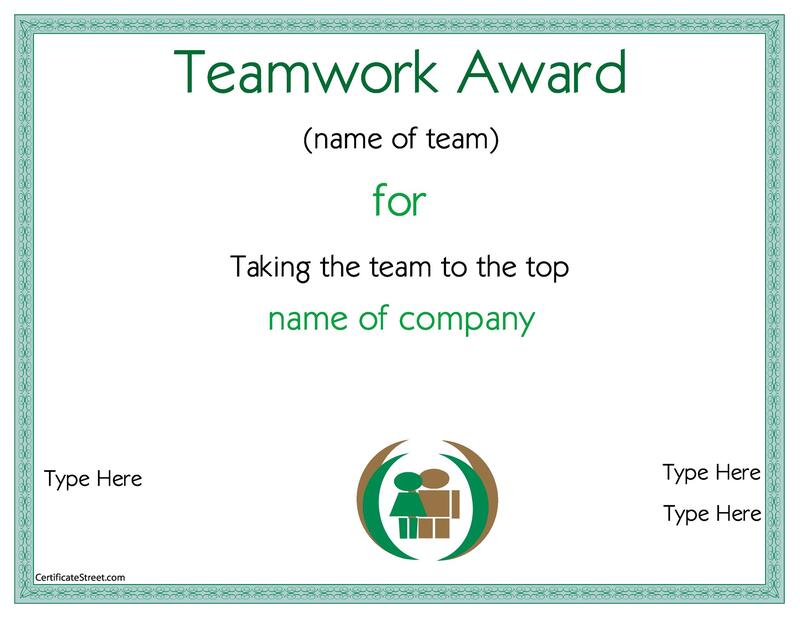 When a difficult task is finished, sometimes it requires a bit more than a pizza part to boost your team’s esteem. 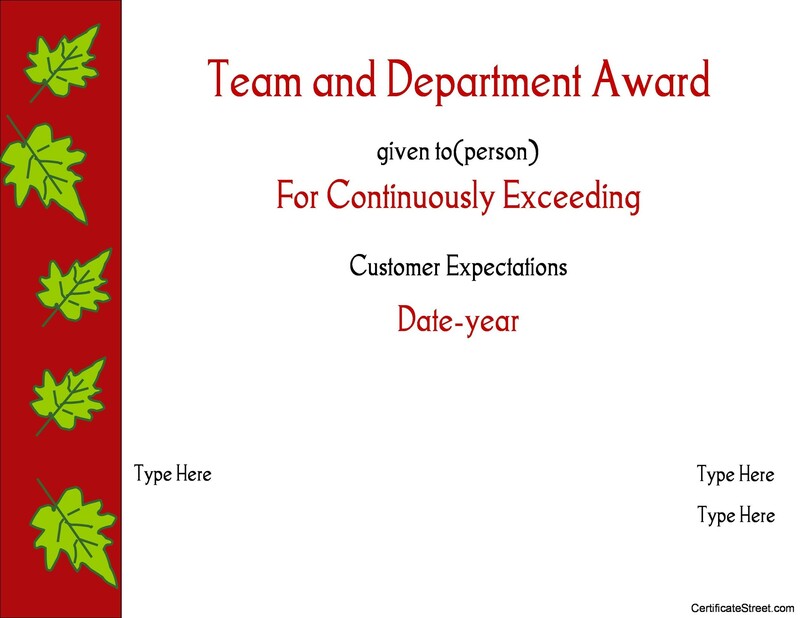 Consider giving an award to the team with the most difficult project completed this year. A gift certificate for pizza at home may mean more to them than at the office, especially after several 60-hour workweeks. Nobody wants any department to struggle with performance, but sometimes issues come about, especially in company processes, that slow us down along the way. 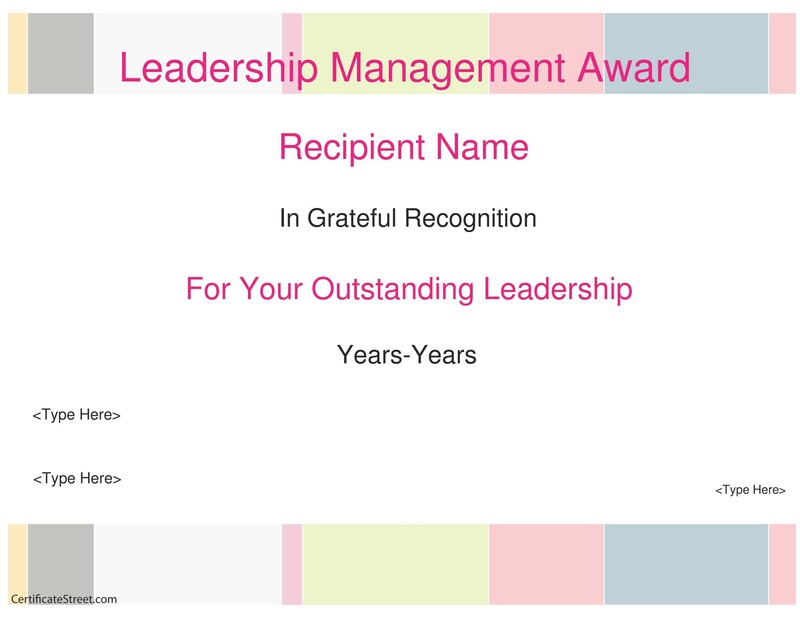 When a team, department, or individual transforms a struggle into a success story, there’s no better way to recognize them than offer an official award that thanks them and shows off their improvements. 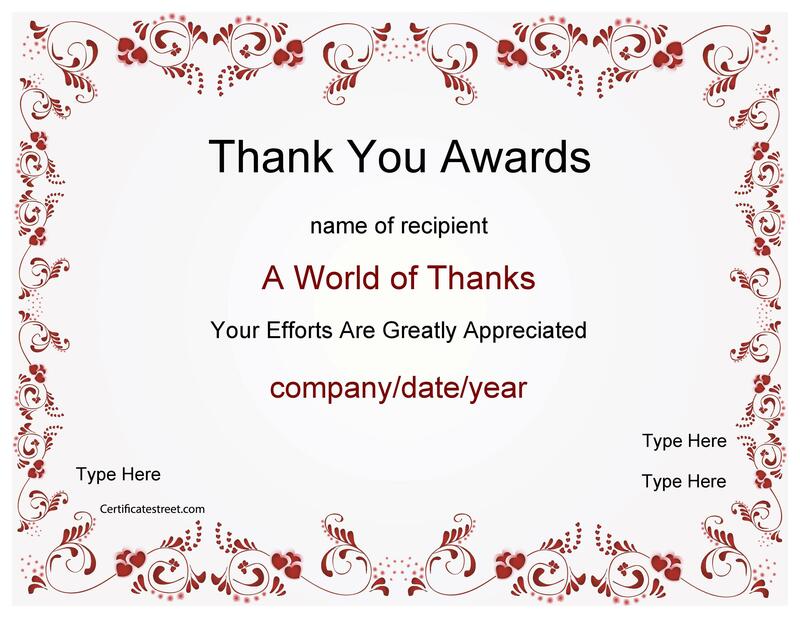 This type of award should have something besides your printable award templates – it should also offer something of monetary value, such as movie tickets or a gift certificate for a dinner out. 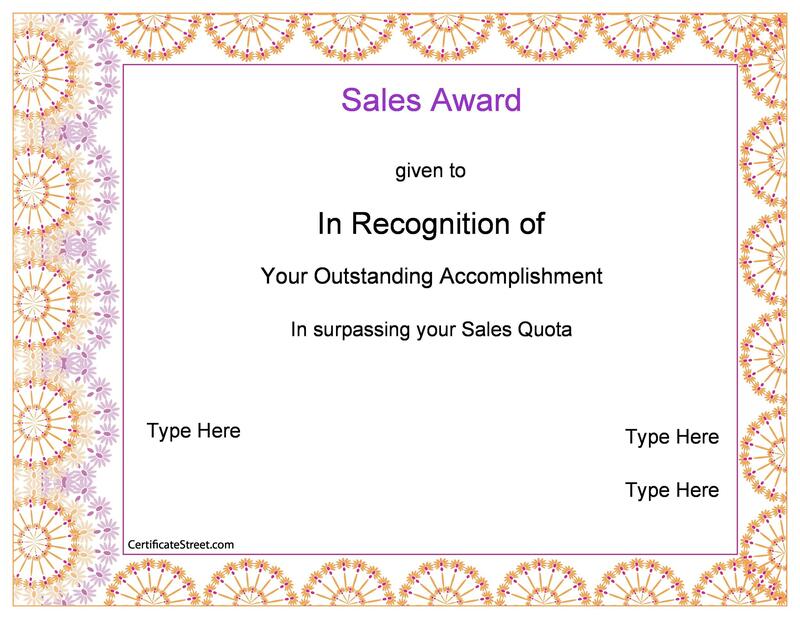 If several departments are struggling, such as sales departments for different products, you may want to encourage a healthy competition that has an award at the end. 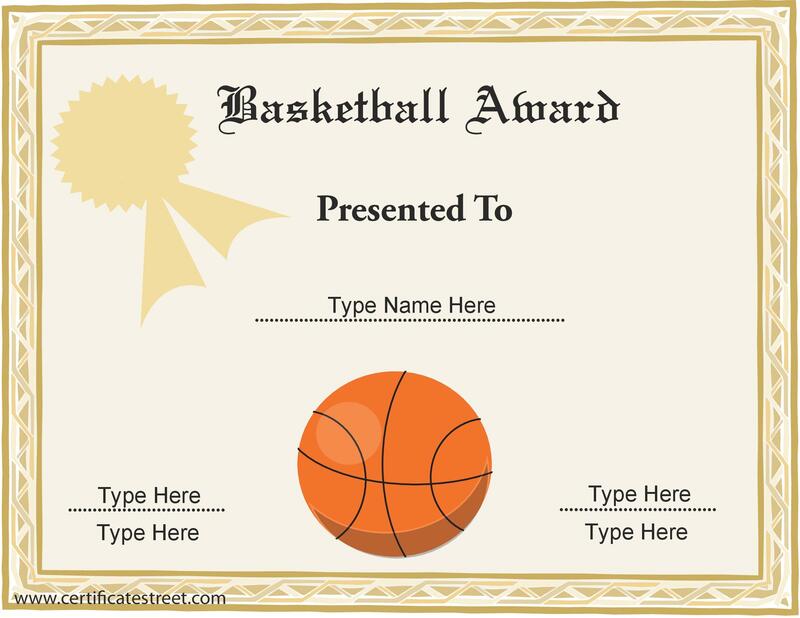 Certain types of awards should be offered at a specific interval every year. 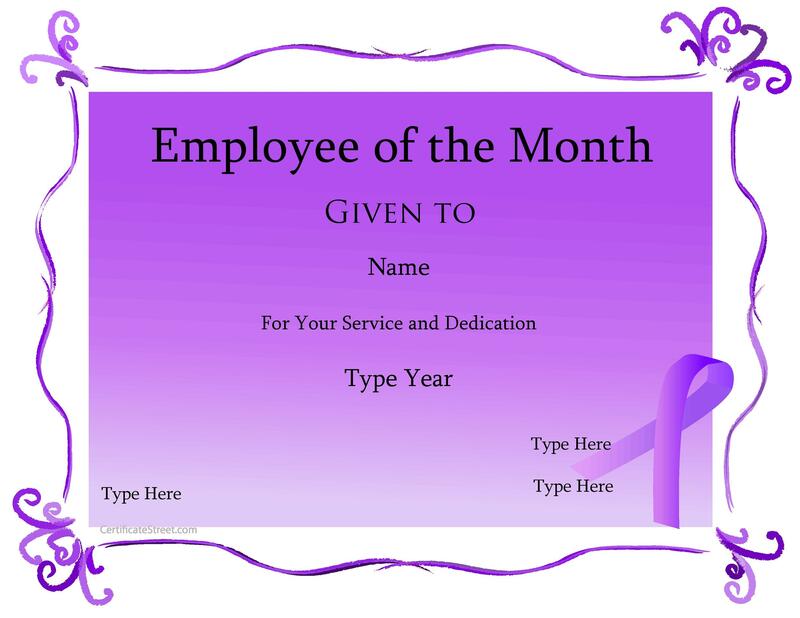 Many companies will have an employee of the month award, every month. However, that award is only one person. 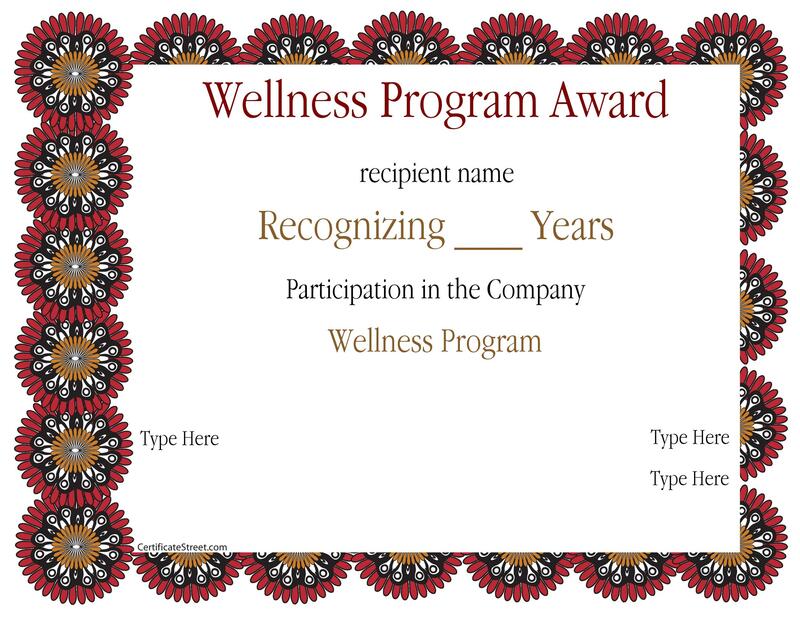 It’s better to reward employees regularly and foster a bit of health competition. 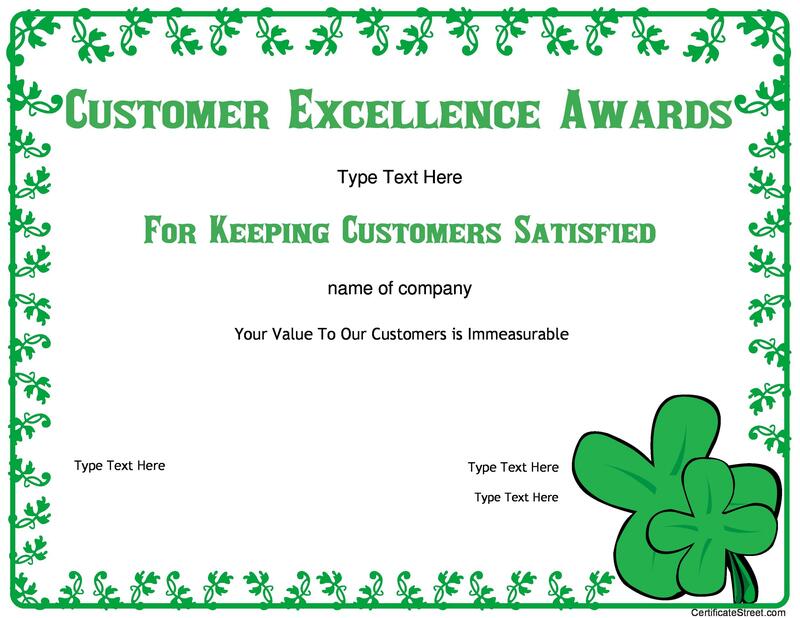 Can you create awards every month to reflect minor improvements, such as a small percentage increase in sales or customer satisfaction? 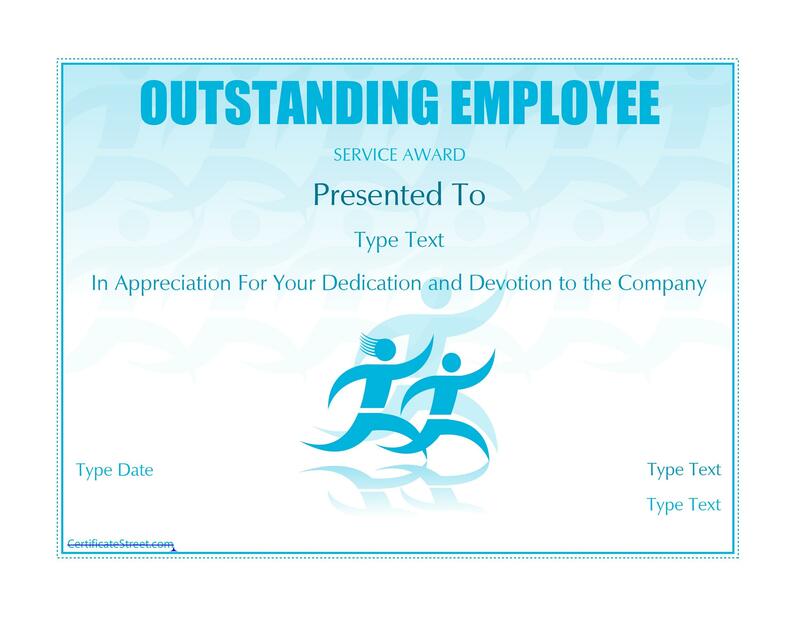 Awards are also a great way to thanks employees when they fulfill a goal. For example, if you manage a restaurant, you may want to boost sales of your premium wines. You may want to set a goal of selling 15 bottles per shift. If your employees are able to do this, you can award all of them with something valuable to them, such as choosing a day to leave their shift early without docking their pay. 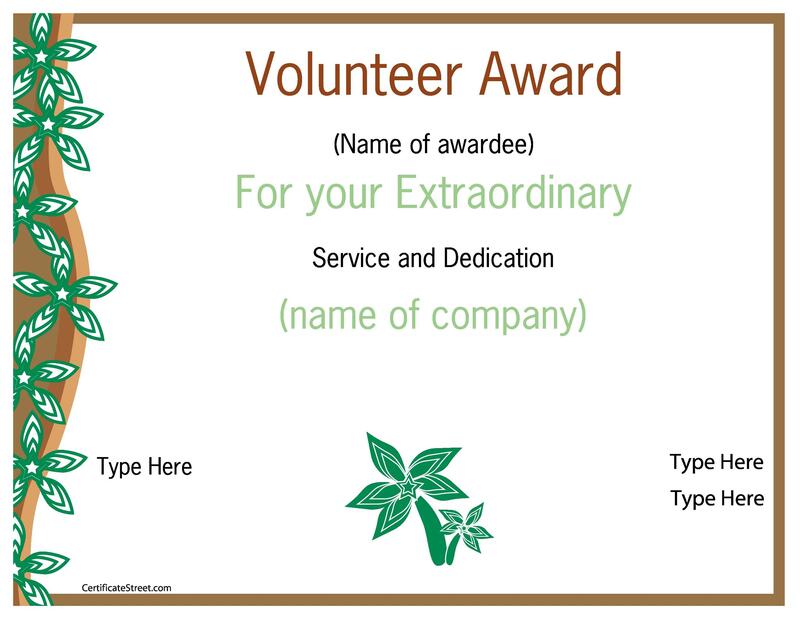 You may also want to reward the waiter or waitress who sells the most wine. 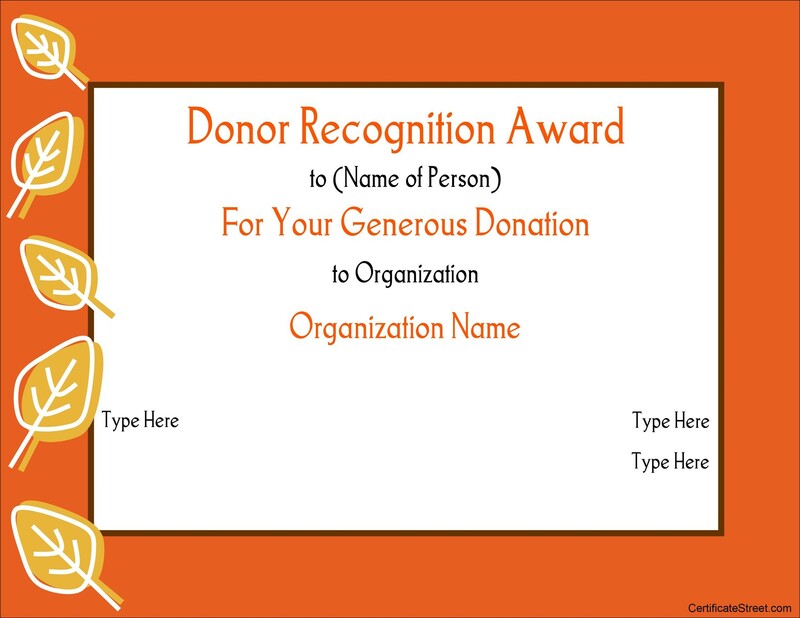 By doing this, you will use an award certificate as well as a gift certificate to a place like Best Buy or the movies. If your business requires lengthy training classes, some of your employees will do better when offered outside incentives for learning. 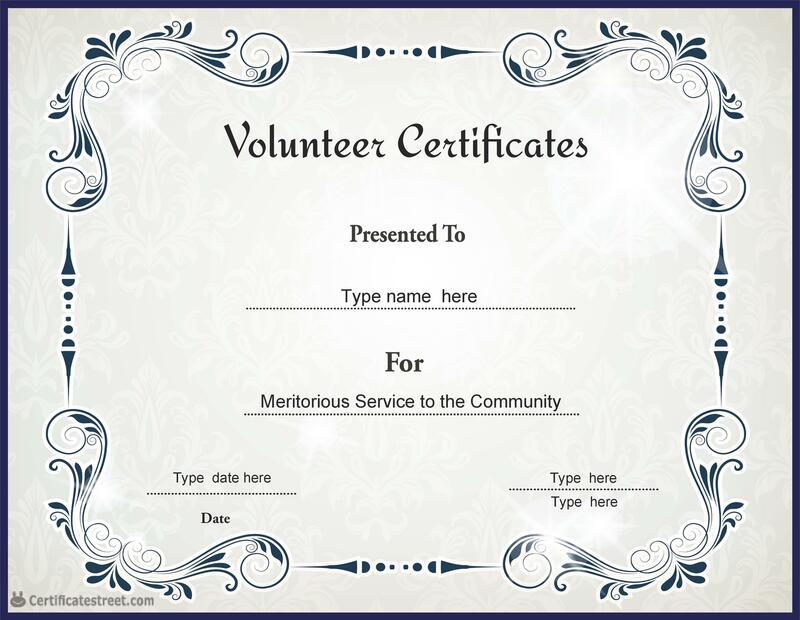 At the end of the class, you may want to award them for the knowledge they’ve obtained. For example, if Joe gets 100% on each skills test, you may want to give him an achievement award for the effort he put into learning. 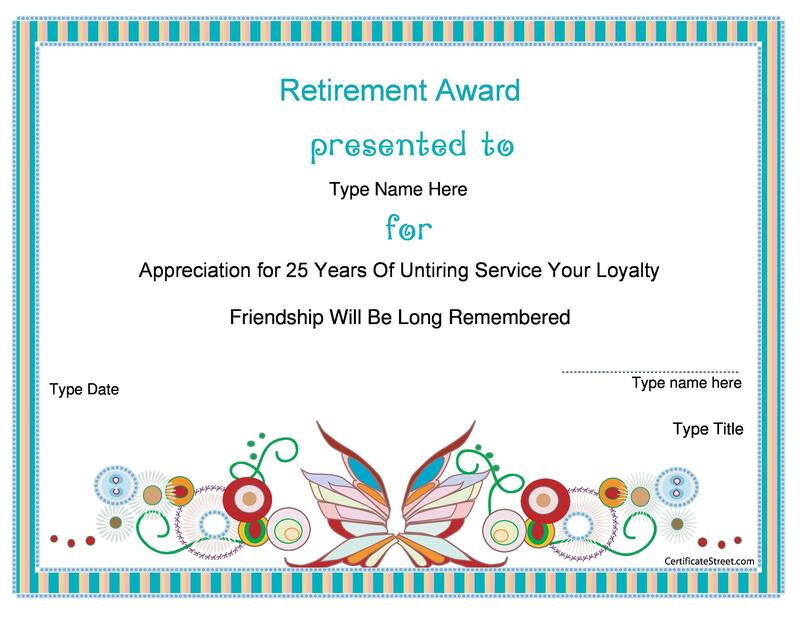 However, if Jane has taken the best notes and offered to share them with the class, you may want to reward her, too! Incentives are always a great way to get people interested in learning. Because of this, there are a variety of ways to create the best awards possible. 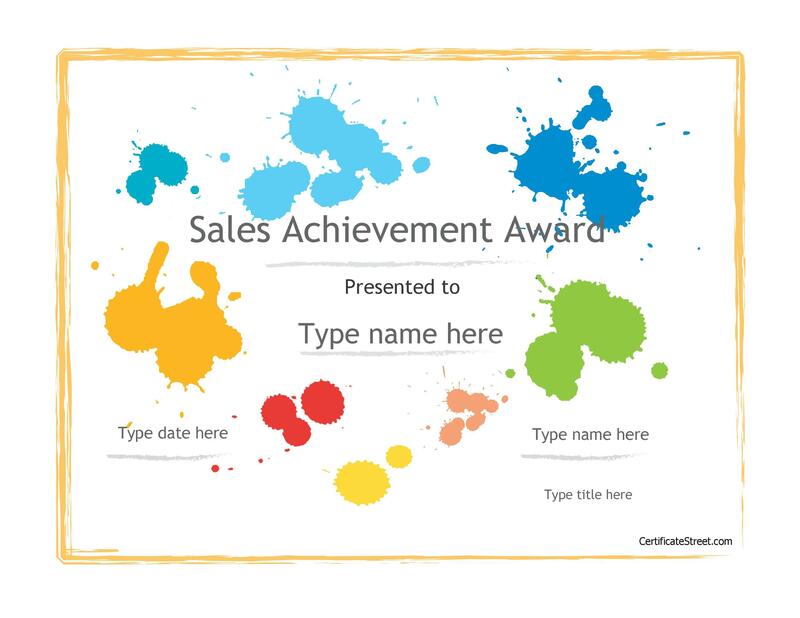 Are you looking for a unique way to use the award templates on this page to stand apart from the crowd? Maybe it’s time to create your own awards for your industry. 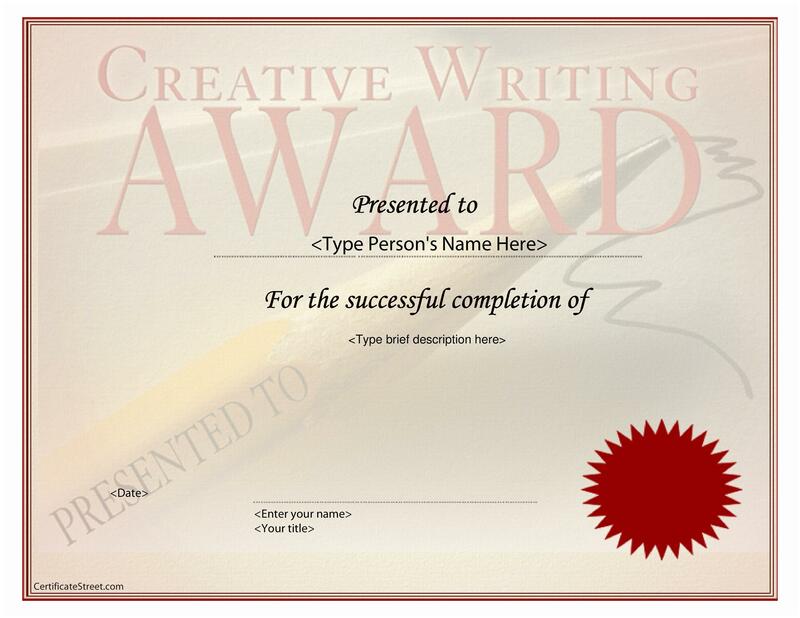 Creating your own awards is a great way to network with your industry and quickly become a recognized name. 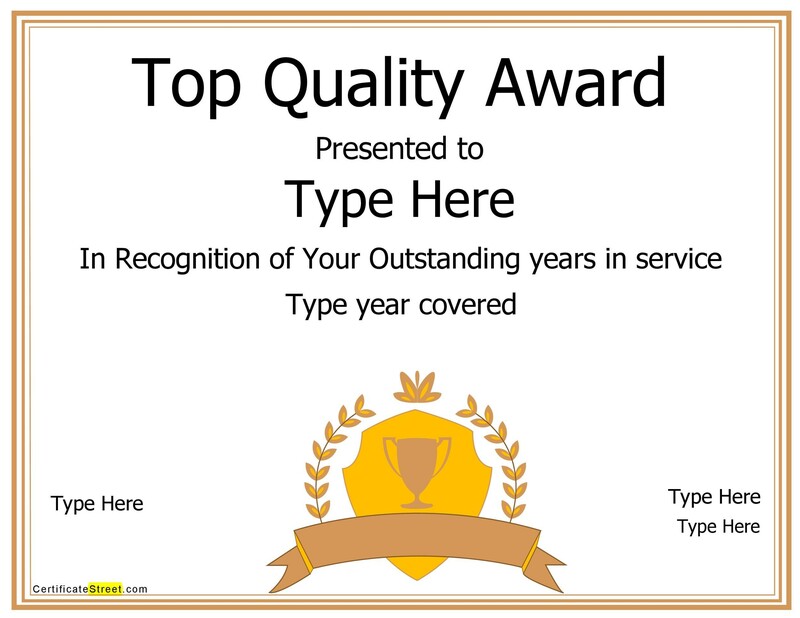 For example, if you are a web designer that works with other web professionals in the automobile industry, why not have yearly awards for the “best of”? You can even have a list of affiliated businesses help vote for these awards. 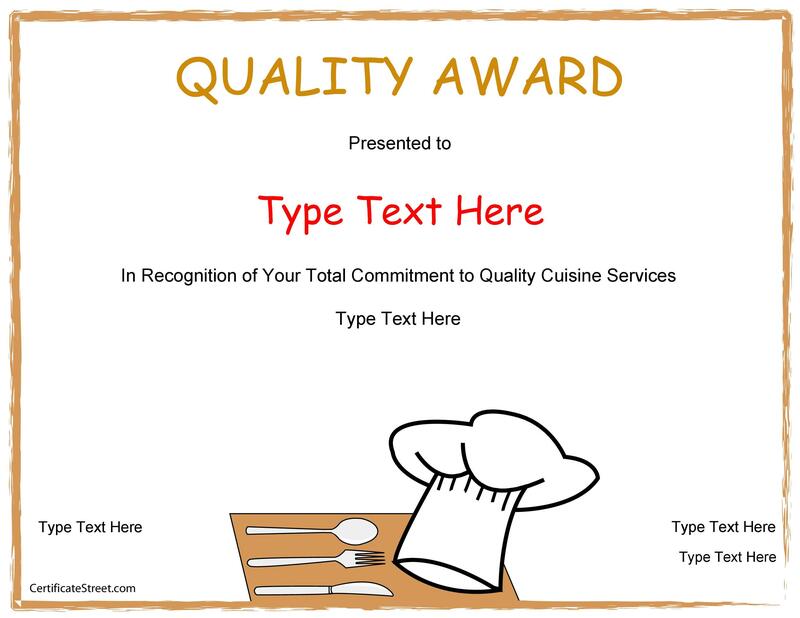 Once you’ve decided that you want to create awards, you’ll need criteria for judging them. Who will be able to vote on the award winners? Will you have a mail-in ballot or online voting? If you vote online, how will you prevent double-votes? If you want your awards to have a viral element to them, you may allow one vote per IP address per day. You can also require registration for the awards, which will help you build a great email/mail delivery list. 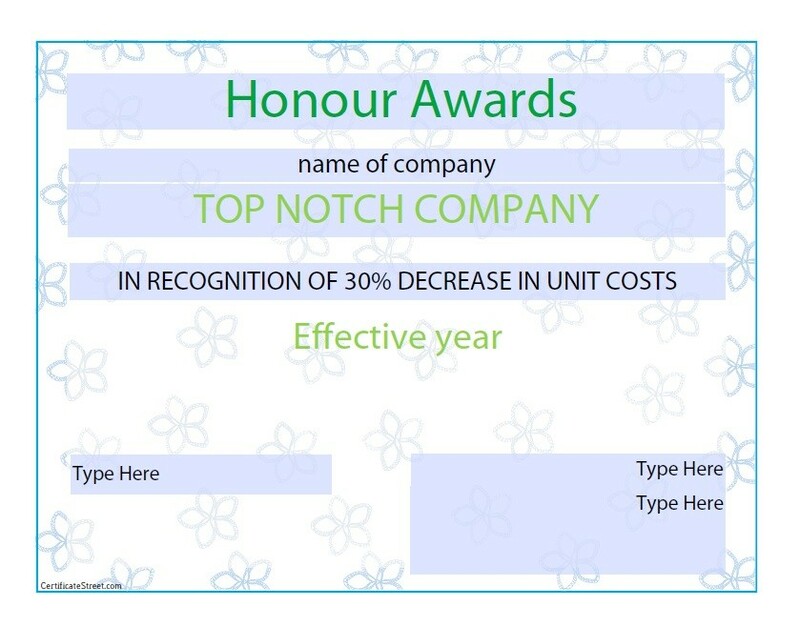 Setting up an award system won’t be easy, but if you do it right, it will be quite beneficial to your brand. If you have business partners or a board to answer to, you won’t be able to make this decision on your own, but you can map out a plan to present it at the next available meeting. 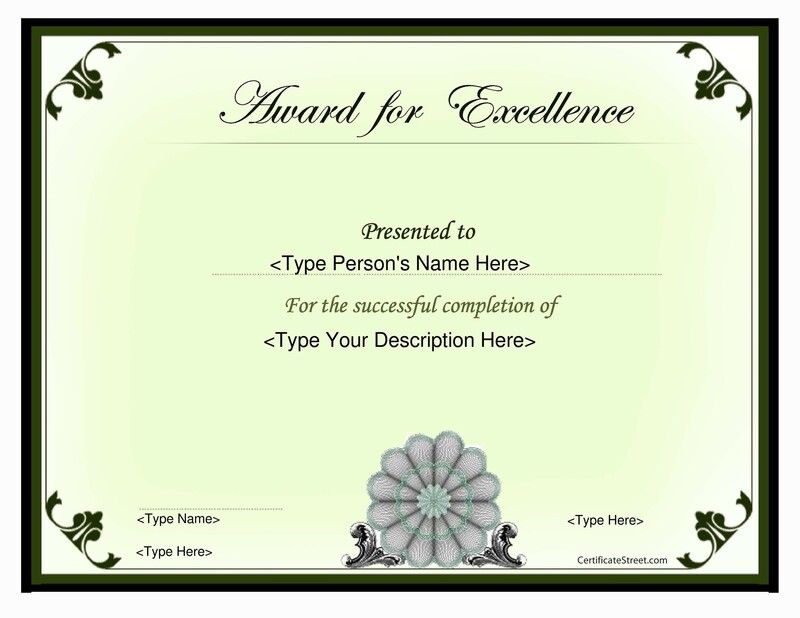 Having an award template on hand for your awards is important, but don’t forget that there are other means of recognition your award winners will seek as well. 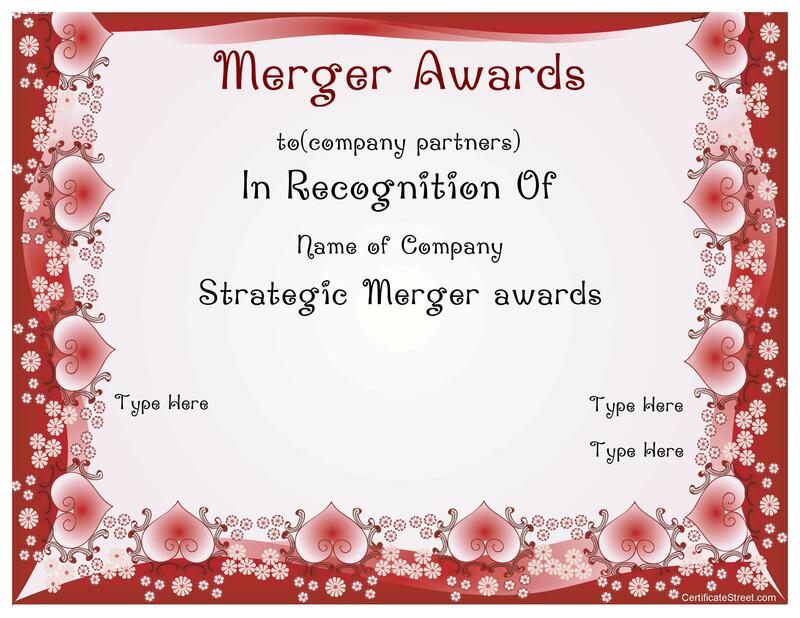 For example, you will want to send press releases announcing your award, and subsequent award winners, to industry-related publications. You’ll also want to make sure you spread the word online in any forums, on LinkedIn, and in other places you do business. 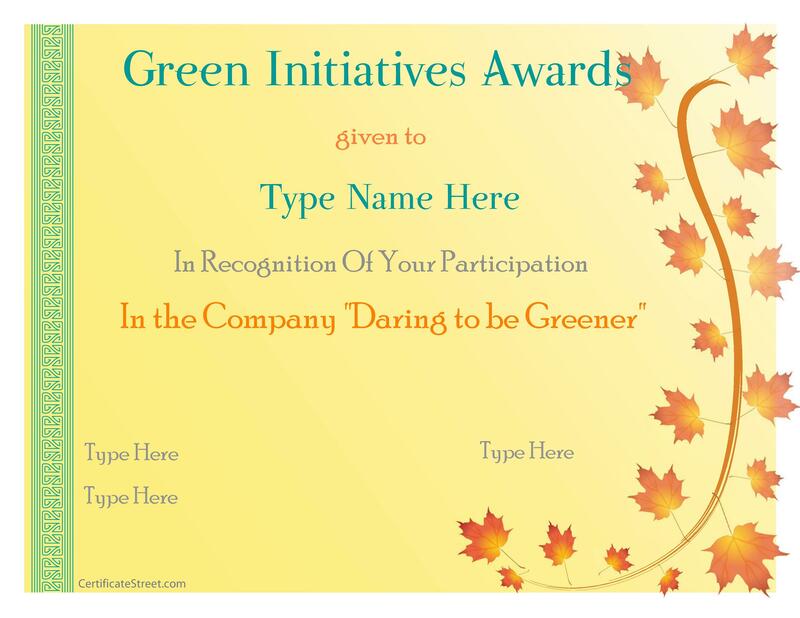 Play with your free award templates and see what colors or graphic elements look the most professional. 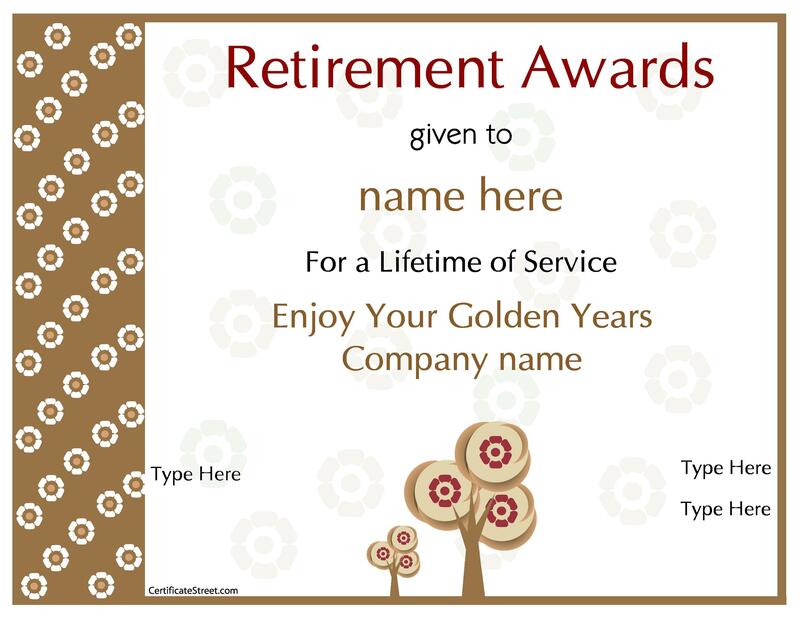 When adapting your award templates, you will want to add some branding elements to them to help build your own image. Don’t, however, allow these elements to outshine the meaning of the award. 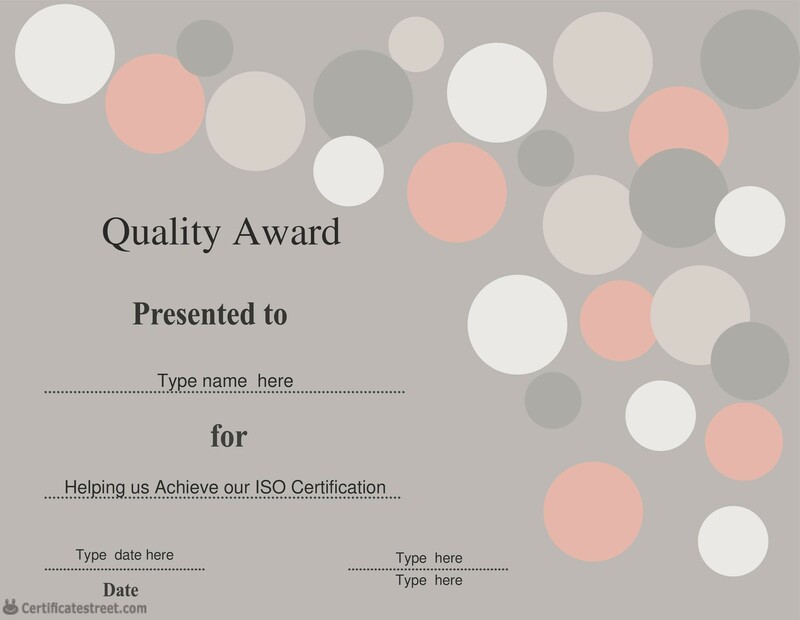 Keep the design and award title simple. You’ll be glad you did when the time comes to present them. 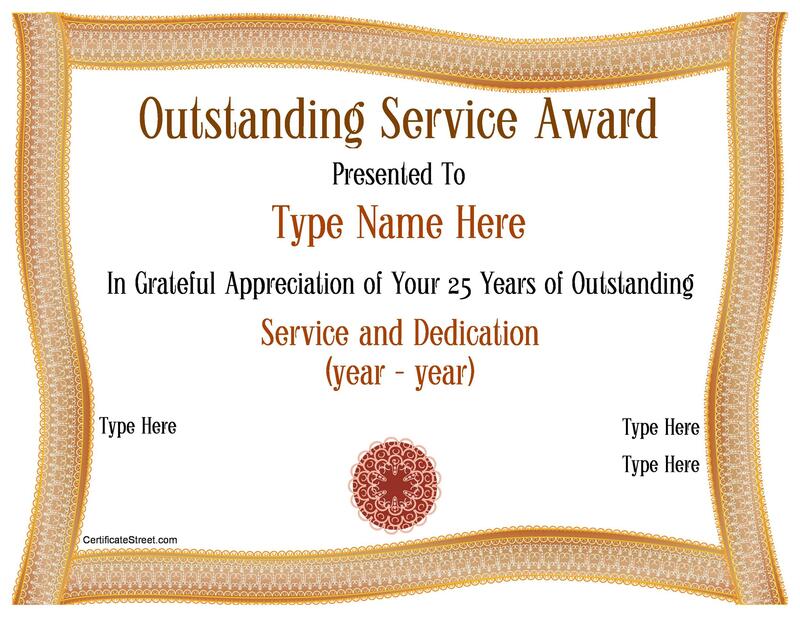 There are many essays out on the Internet debating the merits of giving away awards to schoolchildren. 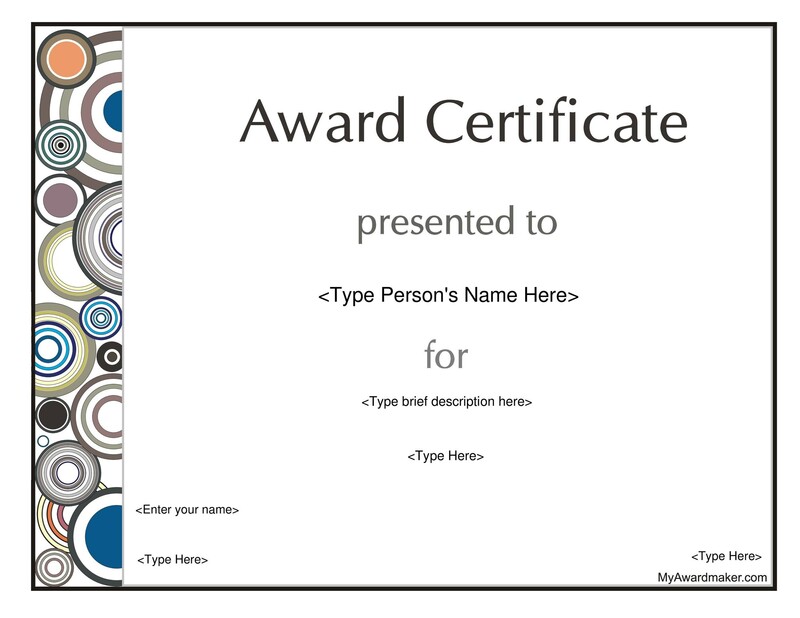 For the most part, teachers agree that award certificates are a good thing; provided they don’t make anyone feel left out. 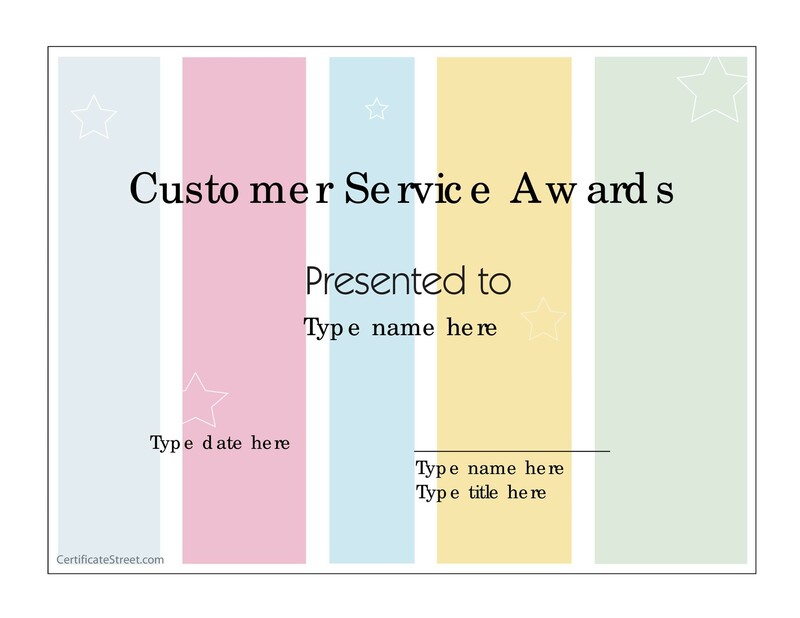 We have many free award templates on this website for you to choose from. The most important thing is that you make sure everyone is recognized. 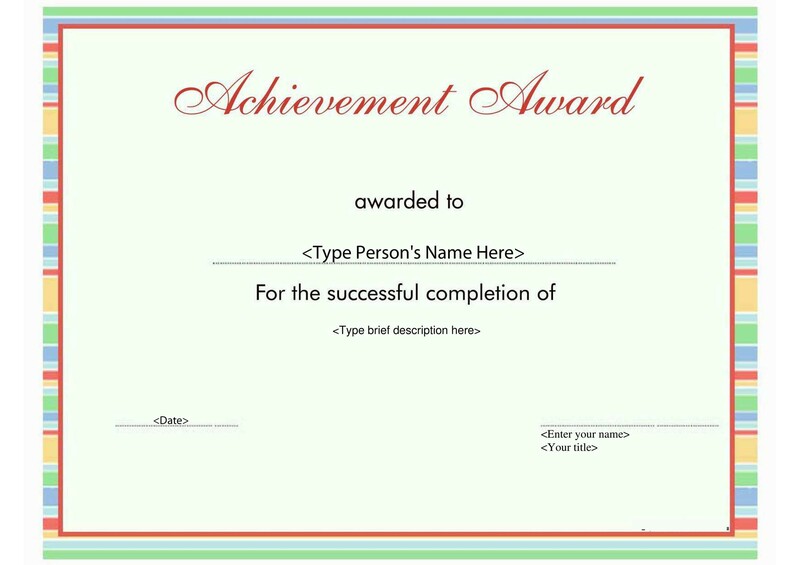 It’s best, when assigning awards, to avoid words like “best” or “greatest” when it comes to awards. You’re trying to recognize hard word or good traits, not teach the kids to compare out when measuring their own skills and success. You don’t want to hurt any child’s feelings or cause them to lose motivation for things they enjoy, especially if it’s something the whole class enjoys together. 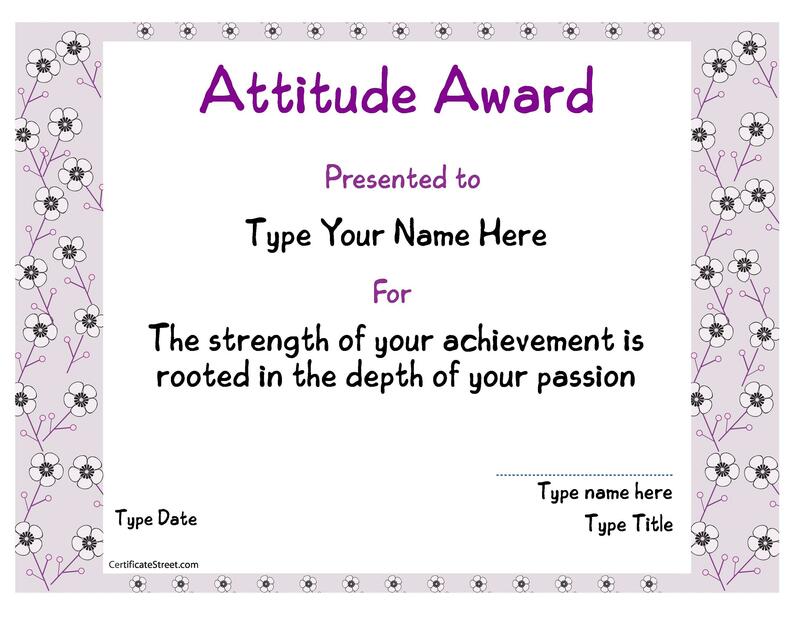 When choosing what type of award to give out, it’s a great idea to pick things that are within the student’s control. For example, a clean, organized cubbyhole and desk take quite an effort when you’re a fidgety eight-year-old kid. 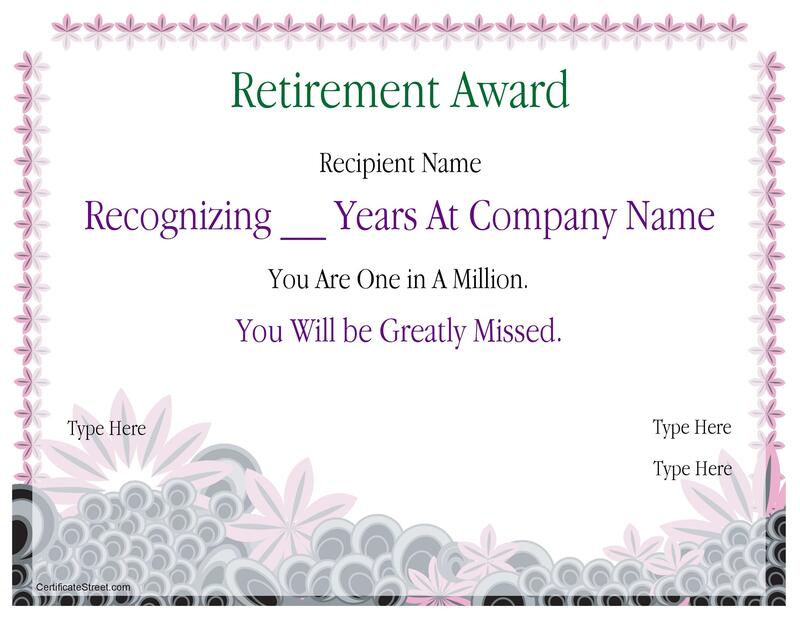 Creating a fun award to recognize your organizational gurus should be easy, as long as you’ve got a few templates at your disposal. 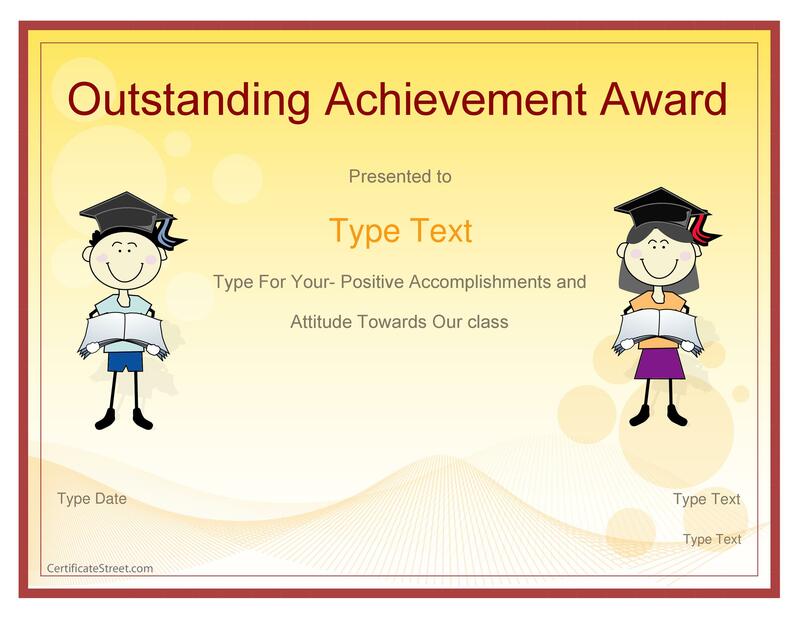 Make sure, if you are recognizing a trait, you present the award with an example so other students, as well as the award recipient, can get a grasp of the desired behavior. Every student in a class has something to give, so make sure that you use your creativity. I’m sure, by now, you get the picture. 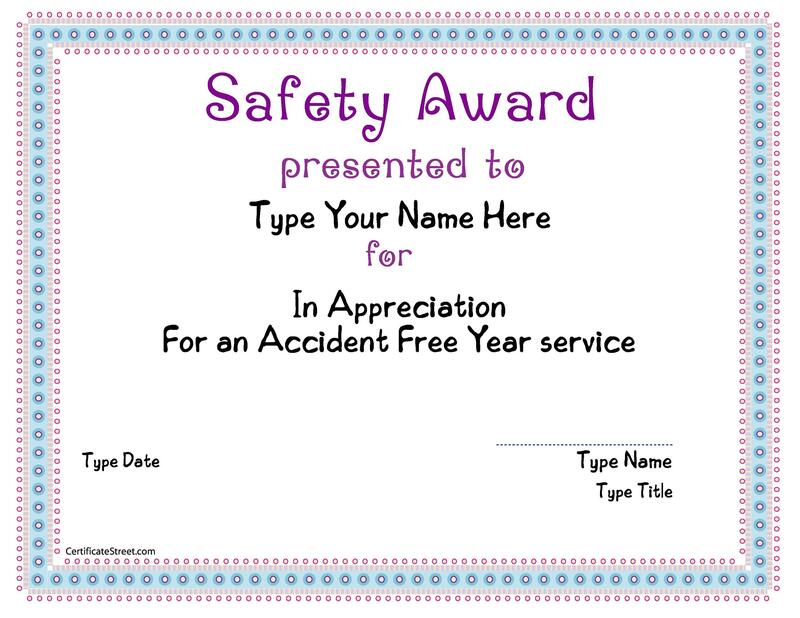 Don’t be afraid to be creative and reward students for behaviors that can sometimes be a bit off-putting as a teacher, such as “Awesome Sense of Humor” for the class clown, although you may want to warn there’s a best time and place for their jokes as you hand out the award. 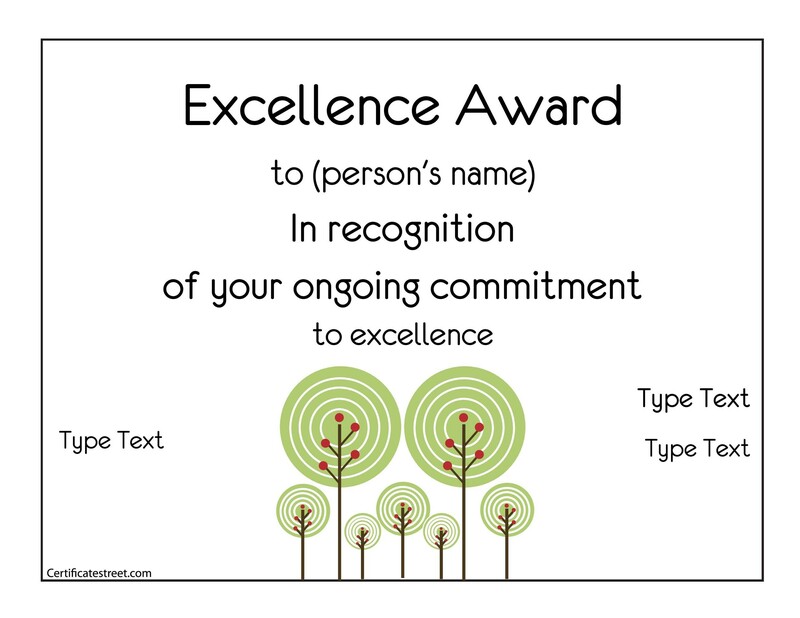 At the end of the year, many teachers like to take the time out to appreciate their students and the unique achievements in ach one. By taking the time to honor each member of the class, you’re helping your class appreciate the role each person plays in he student body. 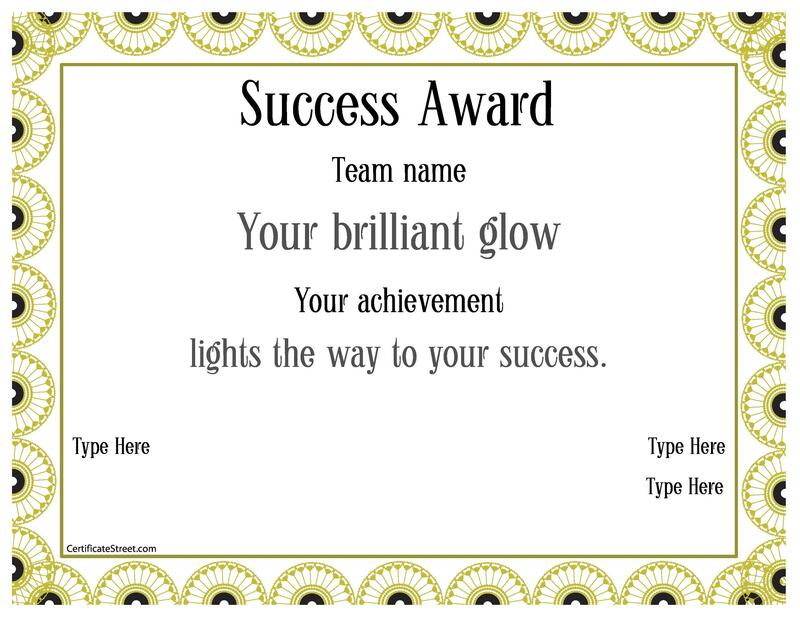 When passing out awards, be specific about praise when talking with students. Let them know what it is, exactly, about their work, relationships and words that inspire you. This will also help you see your students as individuals with unique talents. The idea of rewards is simple; make it fun, treat your kids with dignity, and choose traits / behaviors that can be easily pointed out. 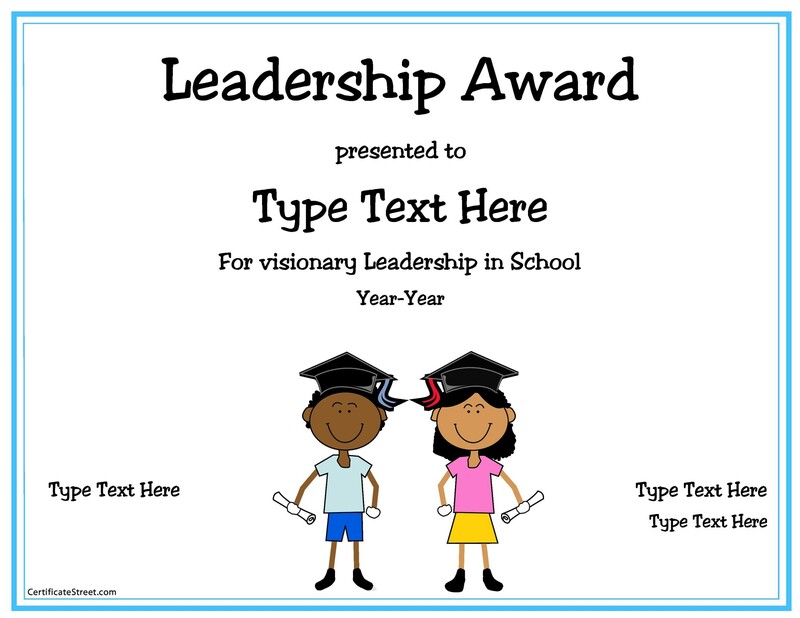 As you know, kids are pretty intuitive, and they will recognize if you’ve given them a gratuitous award that doesn’t really reflect the reality of their role at the school. 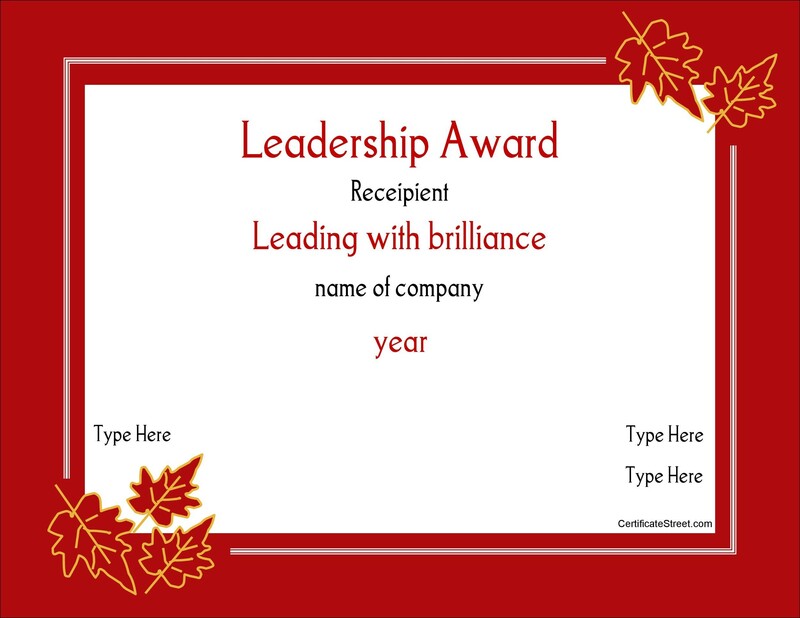 You can even take time to talk to any skeptics’ individuals, and honor their roles in the award exchange.